The overall goals of this project are 1) the development of validated protocols, to be used in the production of Good Practice Guides (GPGs), for the measurement of the electrical properties of graphene, and their implementation in order to achieve accurate and fast-throughput measurement of graphene; and 2) collaboration with international standardisation committees in order to initiate and develop dedicated documentary standards for the electrical characterisation of graphene. The adoption of these GPGs and, subsequently, of such standards, will allow industry to perform accurate measurements of the electrical properties of graphene and thereby provide customers with reliable and comparable specifications of graphene as an industrial product. Discovered in 2004, graphene, is a two-dimensional (2D) lattice of carbon atoms and is currently being extensively investigated by industry as a potential new material for electronics. However, the adoption of graphene as an electronic industrial product is currently limited by the inability to grow large areas of high-quality graphene with uniform and reproducible electric and electronic properties. Therefore, accurate and reproducible characterisation methods adapted to the 2D nature of graphene, both as test samples and in production lines, are crucial. However, such electrical characterisation methods for graphene are presently underdeveloped; and guidelines for the proper implementation of such methods in an industrial environment are lacking. To develop an accurate and traceable approach for the electrical characterisation of graphene through the development and comparison of different methodologies for both contact measurement and non-contact electrical measurement of its properties, with traceability to the electrical SI units. This will include the improvement of established techniques as well as the development of new methods. To develop a high-throughput approach for the electrical characterisation of graphene, with the development of novel methodologies for non-contact electrical characterisations and their validation with established techniques. To disseminate the metrology and methodologies established in this project in the form of Good Practice Guides (GPGs) and input to documentary standards. 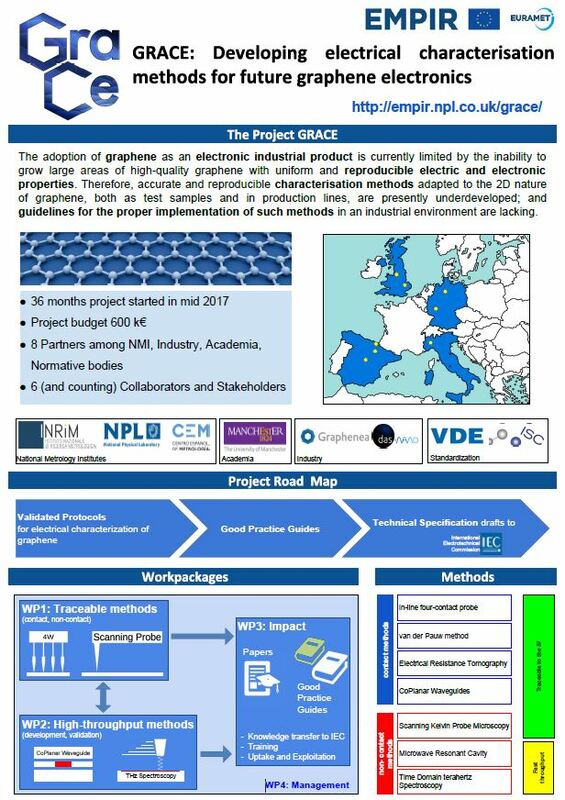 To contribute to the standards development work of the technical committee of IEC/TC113, through the initiation of and development of new written standards for the electrical characterisation of graphene based on the GPGs developed within the project.